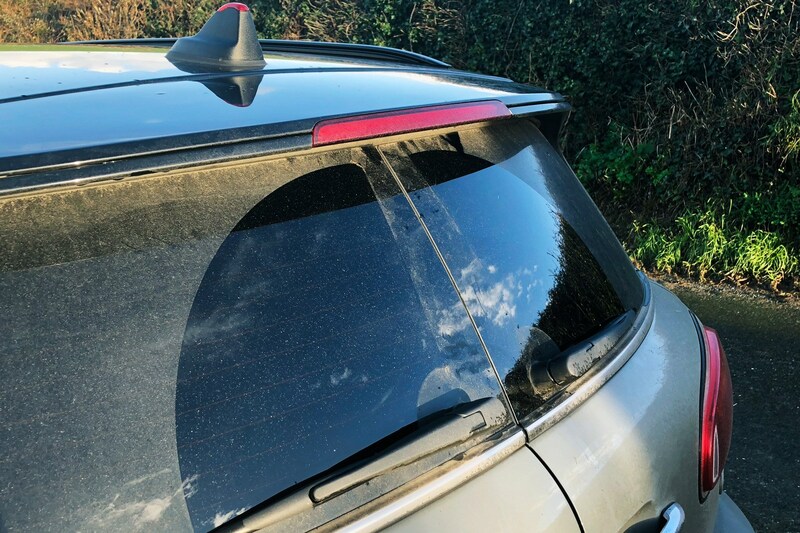 I've already flagged up the huge van-like blindspot created by the vertical post between those back doors – the Clubman's USP. But the visibility takes a further battering in bad weather because the two tiny wipers clear only a tiny portion of the windows. And did I mention the reversing lights are rubbish? They are. Why? They're very, very small, which must have something to do with it. In daylight the plain grey strips on the Mini's door panels look unremarkable. But at night they explode into life. 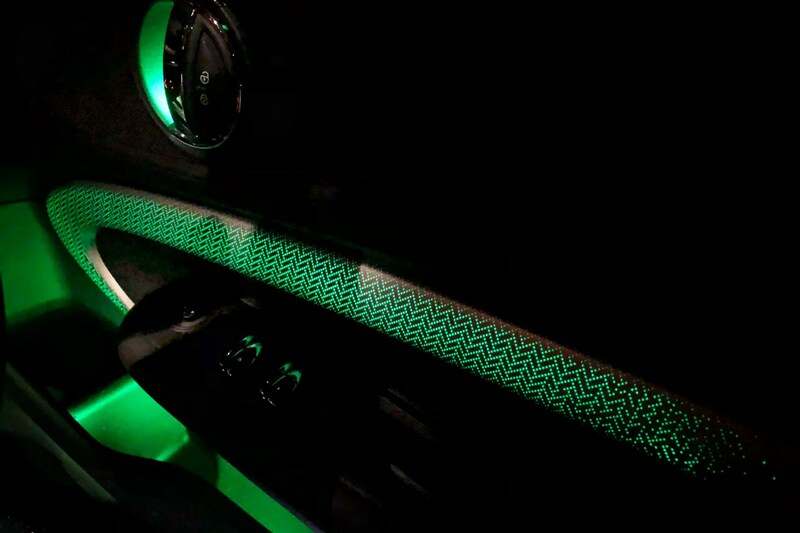 You can change the colour by toggling a switch in the overhead console. They were a £360 option when our car was built but are now only available when you order the £2900 Exclusive package. 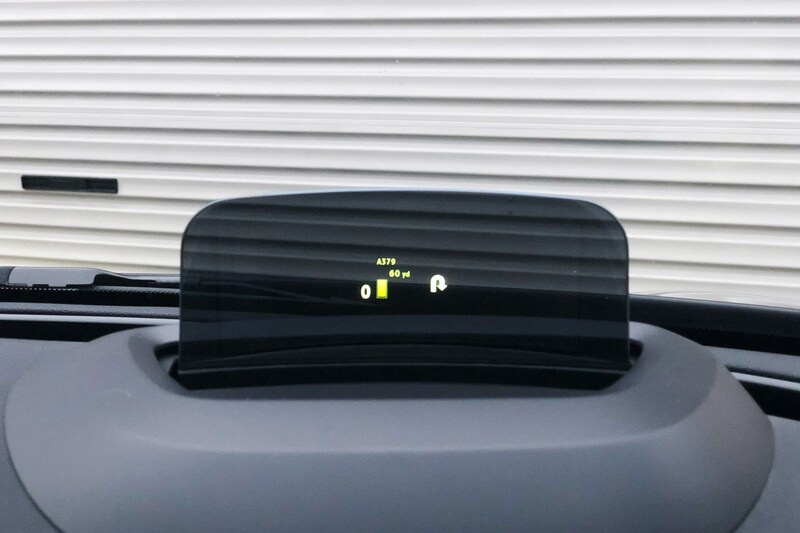 We like a good head-up display, and the Mini's system is as good – as clear and informative – as you'd expect from BMW. It's a £500 extra, but the regular analogue speedo, which squishes the scale into too small a space and is hard to read at a glance, makes the HUD a must-have option. The reversing lights might be poor but the headlights are excellent. Our LED units came as part of the now-defunct £3500 Chili Pack, a popular Mini option since 2001. 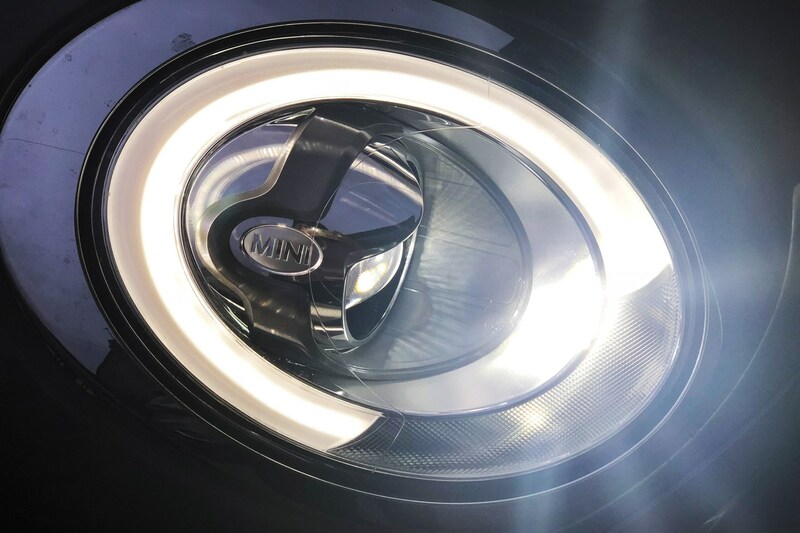 Mini has rejigged the spec and they're now a £750 option, but if you're taking the plunge it's worth forking out another £150 to add the cornering function, which is also very good. Who wants a boring old tailgate when they could have a pair of cool van-style back doors, eh? People who want a clear view in the mirror, perhaps? Or people who find opening two doors instead of one to put something big in the boot a nuisance. But if you’ve bought a Clubbie over a regular hatch, you’ll probably find them quirkily characterful. And their upright orientation really does make the most of the 360 litres of space. in Cumbria is a 393-metre-high, white-knuckle, single-track climb that corkscrews skywards before plummeting to earth again past a fort once occupied by the Roman Empire's unluckiest centurions. It's supposedly the joint steepest road in the UK and, despite the arthritic-tortoise kind of speeds involved, one of the most exciting. Unless you're an 11-year-old glued to Fortnite on the iPhone in the back seat, in which case it might as well be Monks Way, Milton Keynes. Me being in the front, I thought it was pretty great. Always have. Though I come to the Lake District two or three times each year, it's probably 20 years since I did Hardknott. Which means I probably last did it in an Issigonis Mini. The original Mini, a multi-Monte winner, scampered up here no problem. And the Clubman, though 40 per cent longer and twice as heavy, makes light of it, too, helped by some shared characteristics: quick steering, great visibility and a three-cylinder engine that's bigger on mid-range grunt than its 134bhp would suggest. Just like an old 1275 Cooper S.
The big difference between then and now? Brakes. Getting up Hardknott is scary enough, but getting down the other side used to be twice as terrifying on single-leading-shoe drums. No sweat with the Clubman's four-wheel discs and chunky 245mm tyres, though. In truth, getting over Hardknott was never going to be the issue. Getting to it might have been. Minis have always been urban, short-distance cars at heart. 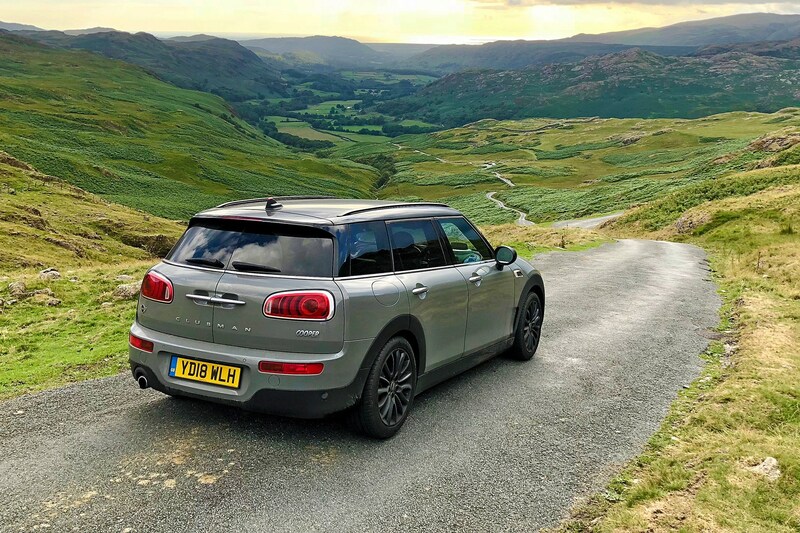 The Clubman is a big Mini, but faced with a six-hour drive to Cumbria and a mountain of luggage could it play the role of a big car? It could, and did. Well, big-ish car. There's only so much big-car character (and big-car quantities of luggage) you can fit into a 4253mm footprint, but the Clubman proved it can do all the sensible stuff the strait-laced VW Golf it's competing with manages. It cruises easily at motorway speeds, wind and road noise is well suppressed, and you can achieve a genuine 40mpg with little effort. The only nagging doubt was the pain in my left buttock. I'm not sure the Mini's seats are cut out for seriously long journeys like the duller VW stuff is. More tyre woes. Last time it was a pothole splitting the sidewall of the Octavia vRS the day before a seven-hour drive to Newcastle. This time the Mini picked up a screw the morning of what turned out to be a five-and-a-half-hour trip to Brighton. Maybe I should just stay at home. 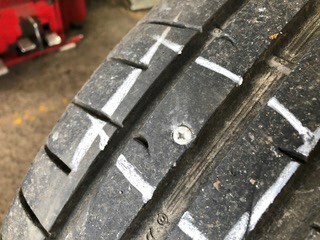 ATS, my local tyre retailer, couldn’t get the correct 225/45 17 Dunlop Sport Maxx for the Mini in time. A plug was the only option, and – since the fitter fixed it for free as a favour – it was around £93 cheaper than a new hoop. This month Mini has been rummaging through its regularly ransacked catalogue of old model names again and come up with the ingenious City, the only Clubman to sneak below the £20k mark. Designed with fleet drivers in mind, the £19,995 City undercuts the Cooper by £1090 in its cheapest form but still comes with cruise control, navigation, rear parking sensors and Apple CarPlay as standard. The inevitable downsides include a downgrade from the Cooper’s 17-inch wheels to tiddly 16s but the big difference comes under the bonnet. Like the Cooper you can have diesel or petrol power, but both are massively detuned. So instead of our 1499cc Clubman’s 134bhp, the City makes only 101bhp and the 0-62mph time swells from 9.2sec to a dreary 11.3sec. Still, that’s better than the 24-odd seconds it took an original 850 City back in 1980. Progress. Despite the drop in power and performance the City posts the same 131g/km CO2 figure as the Cooper and an identical 48.7mpg. We haven’t matched that yet, our best tankful so far being 45mpg on a really gentle motorway run, with quicker journeys returning nearer 37mpg. Through the city – or the hamlets that are the nearest we have to cities in rural Devon – economy drops to around 32mpg. Must try harder… both of us. Minis? I’ve had a few. Bought ’em, sold ’em, raced ’em, crashed ’em, crushed ’em. Everything from a ’64 Mk1 with sliding windows and floor-mounted starter button to an ’01 Mk1 of the BMW variety, and many in between. 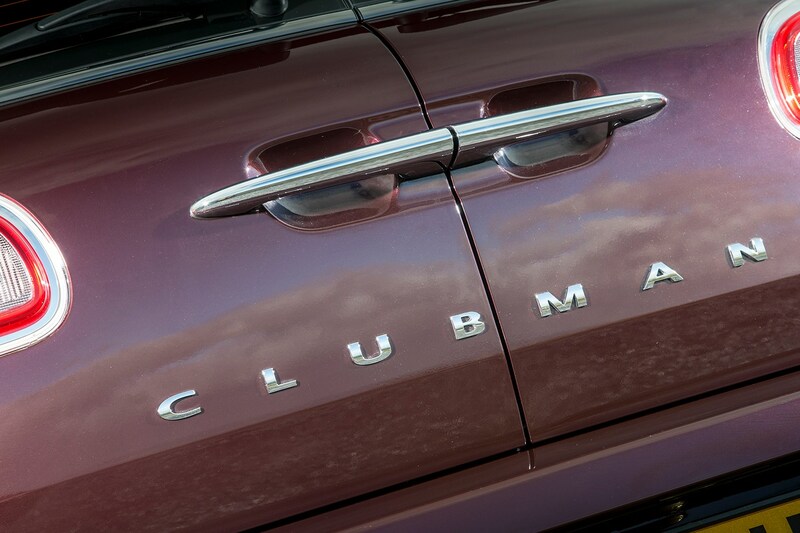 But never a Clubman. Not the square-front original, British Leyland’s awkward attempt to modernise and glamorise Issigonis’s blob 10 years into its life. 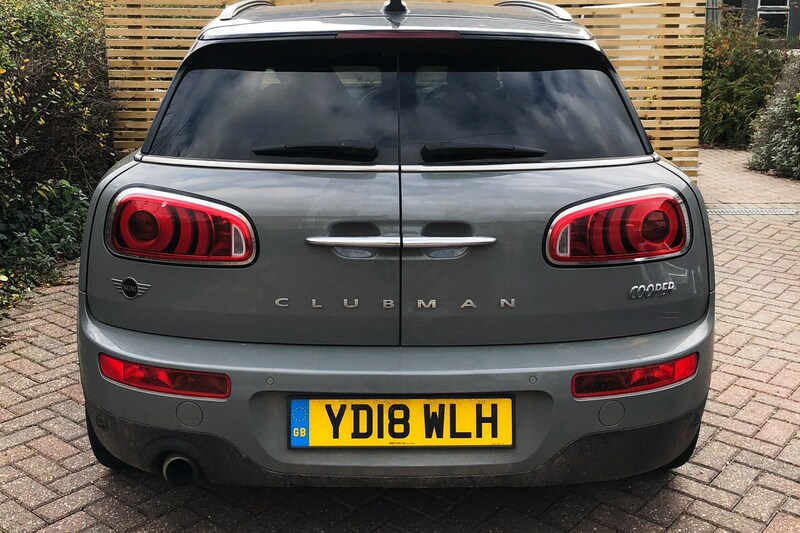 And definitely not the style-over-substance BMW Mini Clubman introduced in 2006 with the single rear suicide door that, for the Brits, decanted your kids into oncoming traffic (though, like any parent, in grumpier moments I’ve wondered if this was actually such a bad thing). For the current Clubman, however, I’m happy to make an exception and break my duck. Even if you think the whole Mini cutesy retro style thing couldn’t be more stomach-churning if the bonnet stripes were printed by Cath Kidston and there was a two-metre-tall Hello Kitty perched on the roof, you’ll have to grudgingly admit BMW’s design team has got this one bang on. The long, low roofline makes it far sleeker than the dumpy Countryman SUV and five-door Mini hatch, and it’s certainly more interesting than rival small family cars such as the VW Golf. And that goes for the inside, too. It looks fun and feels tough, and because it rides on the same 2670mm wheelbase as the Countryman (175mm longer than the Mini five-doors), there’s plenty of room in both the front and the rear. Getting into the back seats is also easier this time because this Clubman has a pair of conventional front-hinged rear doors instead of a single rear-hinged one. Which might not look as cool, but not having to open the front door before you’re able to unlatch the back one gets old quickly when it’s pouring with rain. 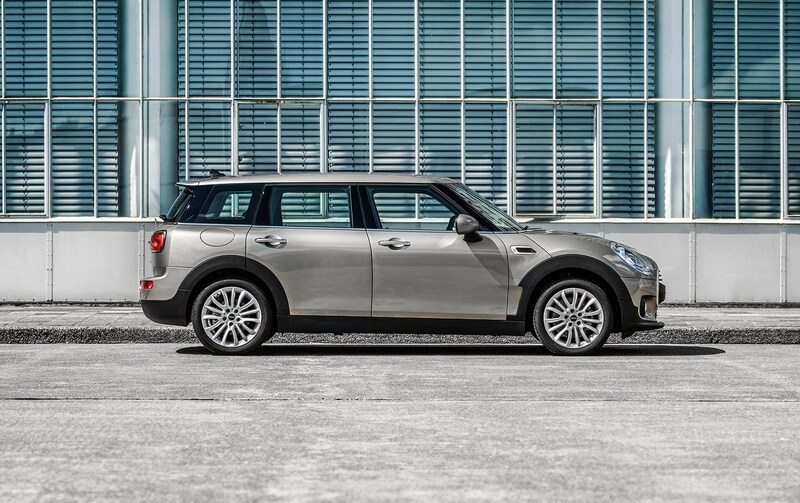 So it’s a genuine family-sized Mini, but don’t be misled by the squared-off rear. Despite the estate-car styling the 360-litre boot is actually 20 litres smaller than a Golf’s. It’s okay, but nothing more, though the eternally sensible Golf doesn’t get the funky barn-door rear doors (below). There might be a reason for that. Is it a genuinely useful feature or an irritating gimmick? Time will tell, and not much of it, I imagine. The most popular Clubman is the £21,045 Cooper, which is what we’ve got. That makes it £3k more than the five-door and £2300 less than the Countryman. Your basic Cooper comes with a version of the now-familiar 1.5-litre triple BMW fits to everything from the 2-series MPV to the i8 sports car. Here it makes 134bhp, gets you to 62mph in 9.1 seconds and is theoretically capable of 49.6mpg. 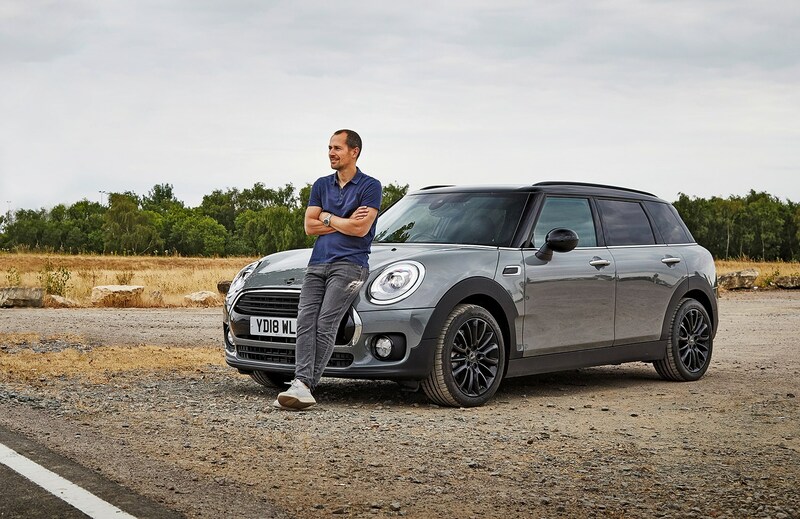 The Cooper’s basic spec is reasonably strong: alloy wheels, navigation, DAB radio, cruise control and a leather-wrapped multifunction wheel are standard. But BMW helped usher in the idea of personalisation when it launched the reborn Mini in 2001, so naturally, we’ve got a few options on ours. The biggest of those is the £3500 Chili Pack (leather trim, parking sensors, keyless entry, LED lights), but we also have 17-inch wheels (normally £670, but £100 if ordered with the Chili Pack), adaptive dampers (£450) and various other gizmos. We’ll cover those in the coming months, asking whether they’re worth the spend, while also asking some bigger questions. Namely, is this bigger Mini actually big enough to cut it as a family car for four Chiltons and dog, whether it can do it while still feeling like a Mini, and if it can help me get over my lifelong square face- and odd door-based distaste for the Clubman brand?